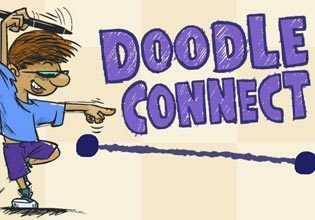 Doodle Connect is the perfect game to pass the time. Attractive graphics in the popular doodle style, a simple concept and tricky puzzles await you! Tricky puzzles? How hard can it be to connect a couple of dots with a continuous line? But once you've tried, and failed, to draw the infamous "Santa's House" a couple of times, you'll know that the answer is: pretty hard. Starting with simple shapes, the aim is to complete almost fifty levels of increasingly complex pictures - your head will soon start to spin.